Getting your novel to sell is a complicated process. I would think that the biggest part of having a successful novel is have a good novel. Well written and well edited. I think I’ve got half of that equation out of the way and I’m working on the editing now. Another part of selling your novel is having a good cover; from the sketches that I’ve been sent by the cover artist I’m working with, I think it’s going to be a stellar piece that conveys the feeling of The Cerberus Rebellion perfectly. As the nation of Ansgar prepares to celebrate a century of peace and prosperity, a war thousands of miles away begins a chain of events that will lead to rebellion, treachery and betrayal. The nation of Kerberos has suffered under the subjugation of the Ansgari throne for one hundred years. Now, after a century of scheming and decades of preparation, Magnus Jarmann is ready to launch a war of independence that will free his people and return his country to its rightful place among the nations of Zaria. Eadric Garrard was raised to believe that he was the rightful King of Ansgar and that his fearful subjects, even his loyal nobles, answered to his every whim. He has spent most of his life looking over his shoulder for assassins with one eye and looking for ways to increase his prestige in the eyes of his allies with the other. So when an opportunity arises to seal two alliances by sending his armies across the Vast Sea, Eadric sees the chance to further his standing with two powerful nations and remind his nobles who rules Ansgar with one action. Little does he know that his actions will bring about events that will change his nation forever. He will discover that his subjects are not as fearful as he thinks, and that his nobles are far from loyal. Raedan Clyve was an ordinary boy until an Elven ritual involving a griffin’s heart turned him into something more. Fifteen years later, Raedan still struggles with the magics that he gained and the consequences that come with them. His problems were compounded when he was thrust into a nobility that he was not raised to have. Now he struggles to rule over a territory in the middle of rebuilding while facing pressure to find a suitable wife and father an heir. When the King orders levies raised, Raedan fears the loss of men will cripple his wounded Barony and he must wrestle with obeying his sworn King or doing what is right for his people. While his brother struggles with his newly-granted nobility, Hadrian Clyve has picked up where their father left off and works to expand his family’s influence. His aggressive negotiation of alliances and shrewd choice of marriage agreements has earned him respect, and resentment. Hadrian’s loyalty to his Duke has put him in a unique position to shape both the destiny of his family and the future of his nation. The Cerberus Rebellion is set on the World of Zaria, where Elves, magic and mythical beasts coexist beside rifles and railroads. The futures of two nations hang in the balance as rebels and traitors trade gunfire with loyalists, mercenaries and pirates. It was definitely too long by about 200 words so I had to trim some of that down. The Cerberus Rebellion is set on the world of Zaria, where Elves, magic and mythical beasts coexist beside rifles and railroads. The futures of two nations hang in the balance as rebels and revolutionaries trade gunfire with loyalists and tyrants. Magnus was born to rule a nation that has been subjugated for a century fights. His fight to free his people will bring him face to face with a king that will not let him succeed. Raedan been thrust into his role as a noble of Ansgar by fate and clever politics. He struggles with the responsibilities of his title and the magics that were granted to him through an ancient Elven ritual. His brother, Hadrian, has made it his goal to make his family a political and economic powerhouse in the nation of Ansgar. He will see his family’s name raised to heights of power through political maneuvering, clever marriage agreements and pure force of will. King Eadric’s grip on sanity is tenuous at best and he sees assassins in every shadow. The fracture of his nation is an affront to his authority and he leads his armies to bring hislost sheep back into the fold. Today, I signed up with Goddess Fish Promotions (interesting name, no doubt) for a series of Blog Tour stops. I decided to go with the more economical route of a “Book Blurb Blitz” in which my book and a blurb will be posted on 5 blogs in the middle of August. That will be followed up by a Review Tour where I’ll be featured and a review will be posted on 5 blogs during the last week of August. That will be followed up with an interview blog tour of 2 weeks (10 stops, each weekday) across the first and second weeks of September, which will run into the two promotions I’ve signed up for with two of the larger e-book promotional sites. Hopefully, combined with a LibraryThing giveaway I hope that this will provide enough buzz for a bump in sales to get the ball rolling. Now, on 3/24 I picked up my new laptop and started working. Between 3/24 and today 4/21 I’ve written a total of 27k words, not including the chapters and snippets that I ended up removing from the story. Which factors out to 30k words in a month, or just over 7,500 words per week. I think it’s really amazing the effect that new hardware can have on your productivity. So I went ahead and started a WordPress.com site/blog. It’s a little bit new, so please bear with me while I work on getting it set up and ready to go! Also, I registered “GunpowderFantasy.com” as my domain name! Expect to have a blurb up for The Cerberus Rebellion by the end of the weekend and hopefully a cover by the end of next week! Last night I clawed my way over the 80,000 word mark for The Cerberus Rebellion. Before the weekend, as I was walkung into my night job, I had a flash of inspiration and used Evernote to plot out the last 8 chapters. Well, one of those chapters turned into 3 chapters but if the last 8 end up between 2-3k words I’ll end up just above 105k. 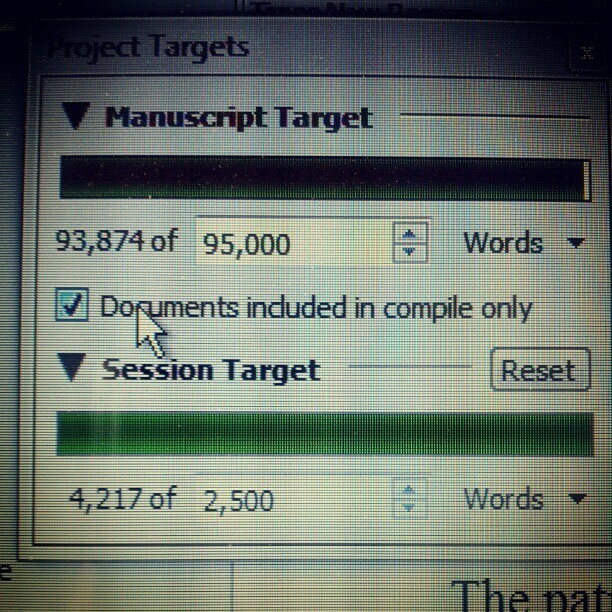 It’s a little higher than I wanted to end up but I figure with rewrites and edits I’ll cut a few thousand words out. I’m still looking for Beta Readers and expect to be through my own first draft editing by the end of May and would like to get it to an editor by the middle of June. If you’re interested, please post a comment. So I was writing a chapter that, when I had started it, felt like a good idea. It filled in some information, introduced a new POV character that I intend to carry on to the next book and did some world building in the process. And then, about 1,000 words into it, I hit a wall and realized that the chapter wasn’t contributing to the story as much as I expected it would and was in fact breaking up the pacing of the story. So I did what I always do, threw it into my “Snippets” folders and started a new chapter. I have over 6,000 words in my Snippet folder. Some of it may be salvageable, but for the most part there’s nothing for me to do with those words. It seems strange on one hand that I can put so much effort into a chapter and then throw it in the bin. Oh well, back to work!